Sunday, May 24th, 2015 was a special Sunday for the members of Messiah Lutheran Church. While Pentecost Sunday is typically a spirited day of worship, this one was super-charged! MLC saw a double Baptism at the first service, and seven confirmed. Featured picture (back row) – First year instructor, Lois Graff, Alie Williams, Natalie Tidwell, Abby Woods (front row) Jordan Mahafza, Michelle Strand, Bridie Ryan, Shane Peterson, Pastor Scott Peterson at second service and a 25th Anniversary Celebration Dinner during the Noon hour that went well into the early afternoon. MLC was set for day of memorable moments years in the making. Messiah’s Narthex was festooned with “Messiah Memories” submitted by past and current members while a large collection of photos from Messiah’s 25 years played on the digital display nearby. In the sanctuary, large red, silver and white bows ribbons perched on pews. The celebration ribbon colors continued behind the altar in the red and white floral arrangements. Dominique Lovett and Robert Lovett received the Sacrament of Holy Baptism. They are the daughter and son of Robert and Rubie Lovett. 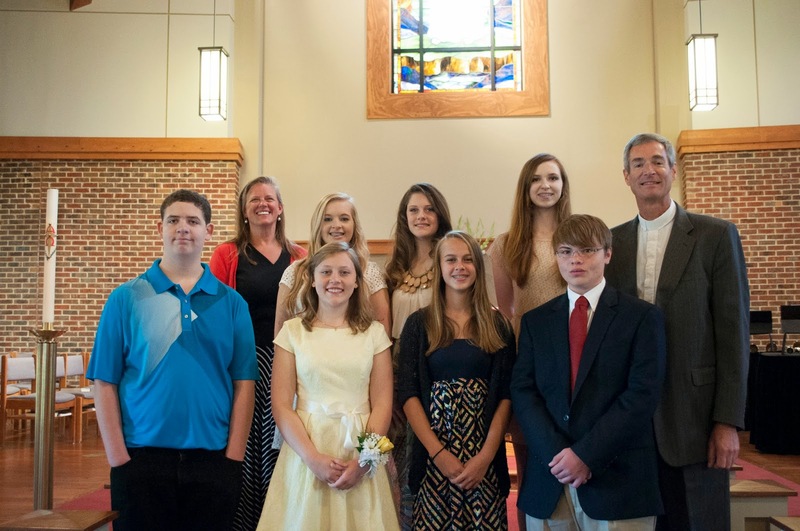 It was also confirmation Sunday for seven Messiah youth. Affirming the Christian faith they entered in Baptism were: Jordan Mahafza, Shane Peterson, Bridie Ryan, Michelle Strand, Natalie Tidwell, Alie Williams and Abby Woods First-year confirmation students and parents organized a reception for the confirmands at 9:45 am in the Fellowship Hall preceding 11 am confirmation service. Fitting to the occasion, Pastor Scott Peterson asked “Messiah’s own” Rebecca (Hanson) Kolowe to give the Sunday Sermon. Rebecca was in Messiah’s first confirmation class and is now a diaconal minister serving as Director of Evangelical Mission and Assistant to the Bishop in ELCA’s Southeastern Synod. Sunday worship concluded, and the long awaited and much planned 25th Anniversary Celebration Dinner commenced. About two-hundred members, former members and guests enjoyed the terrific food and fellowship in the Parish Hall which had been transformed by the 25th Anniversary Committee and a number of volunteers setting the tables. Beth Mumaw, who oversaw the 25th Anniversary celebration, arranged for the cake, decorations, flowers and countless details to come together with the help of a number of volunteers. The dinner, organized by Fellowship Chair Greg Kilby and an all-star group of kitchen volunteers, included ham, turkey, garlic mashed potatoes, trimmings of prosciutto wrapped green-bean bundles, stuffed mushrooms and more. A number of cakes and treats topped of the special fellowship meal including custom m&m’s. Also serving on the 25th Anniversary Committee were Pastor Scott Peterson, Meredith Kilby, Linda Peirce (Messiah Memories) and Karl and Judy Starkloff (DVD Montage). LeeLinda Baggett chaired the 25th Anniversary Cookbook sale. There are number of copies of the cookbook still for sale for $17 a copy. Copies of the DVD photo montage are available at the welcome desk in the Narthex for a free will donation.